Now available are a number of tools which help ensure your published hotel rate is always the most competitive. Simply insert your 12 competitor hotels. These properties need to reflect your own property using criteria such as Location, Brand Reputation and no. of Rooms. If your published rate is lower than the competitors the dates appear in GREEN i.e. you are very competitive, if you are too expensive the dates appear in Red. In addition the tool also shows you the level of "demand" for the relevant date. Fisheyes will provide the Rate Shopper Parity Check Tool which is an instrument designed to indicate any disparities which may arise from time to time. Examples Agoda activates their Private Sale Offer, Expedia does a Geo-Offer in the USA, Booking.com deal of the day…. Any disparities are shown in RED. The check may be performed across stays of multiple nights and different tariff plans. 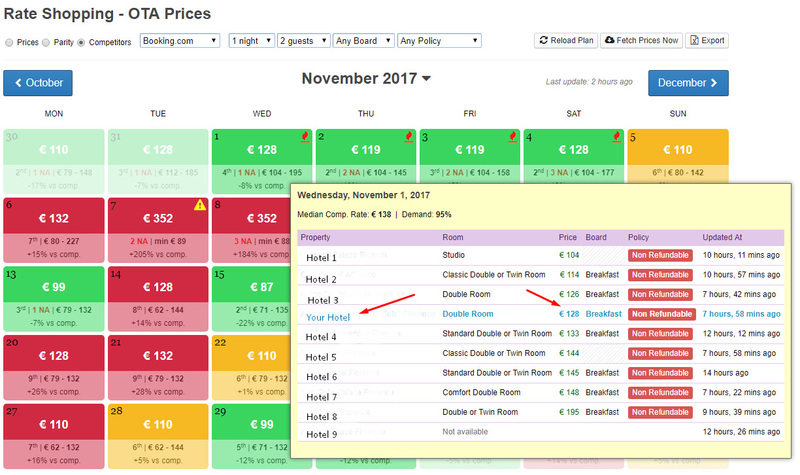 In the example below on Saturday 25th November the website is closed all availability but you can buy a room on booking.com and expedia. This tool represents the advanced version of the Rate Shopper Parity Check and allows you to instantaneous parity check between the direct site and the WHOLESALERS using the otelscombined.com database. overview of tariff disparities.